It’s hard to write an introduction for this wedding, as Jo’s words are the only ones that seem fitting to explain the story of her and Simon’s wedding day. Jo lost her Mum to cancer before marrying Simon. I cannot even begin to imagine the pain this must have caused, let alone just before one of the biggest days of her life. If anyone is going through a similar situation then please read Jo’s words as they are so beautiful. Her and Simon’s wedding is full of love and I feel very honoured to share it with you all this morning. Jo the Bride: When Simon and I got married last October it was third time lucky. Three years before my wonderful mum was diagnosed with a rare type of bowel cancer. We were all totally devastated, but absolutely determined to stay positive and help mum fight through it. So life continued for all of us, and one beautiful, crisp January day, Simon asked me to marry him in front of my favourite place in London, St Paul’s Cathedral. For me my mum was my best friend – my whole life. I was 31 years old and for all of those years we spoke pretty much daily. I’d ring her on the way into work, ring her at home, ring her from Africa, Asia – wherever I was in the world, ring her when I saw something funny or sad or boring or ridiculous. She had been my person. My best friend. And all I wanted in the world was for her to be there on my wedding day, seeing me marry the man I love. However, cancer had other ideas. And as chemo took its toll, Simon and I realised we would need to plan our wedding on the basis of two options. 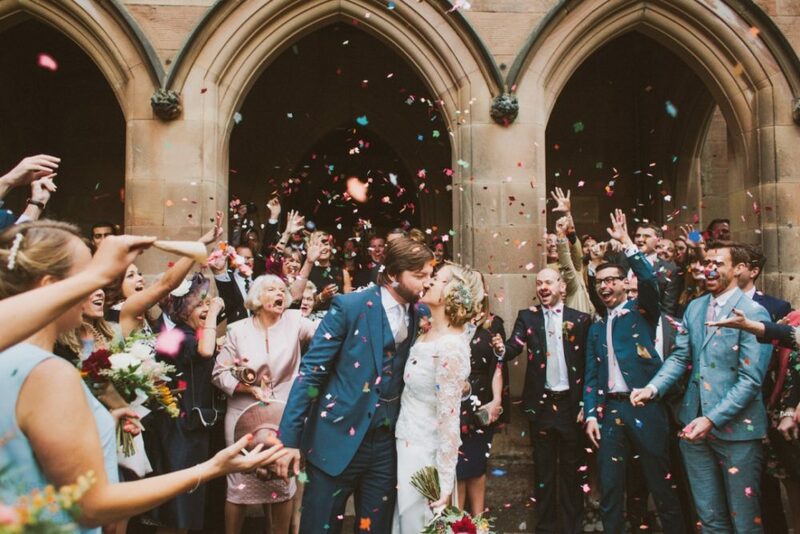 Option 1 was our ideal wedding – a summer festival with all of our friends in a field in Derbyshire. Then option 2 was a page in the back of my notebook – a very small, quick event in the worst case scenario that mum could not make July. We could not even discuss option 2. But as hospital visits got more regular and longer, her already tiny body got weaker and the true brutality of this disease began to take hold, it was clear that time was not on our side. So when mums chemo was stopped, I nervously broached the idea of cancelling our wedding and having a smaller wedding much sooner. She agreed, and our wedding was planned for 6 weeks later. But without the chemo mum deteriorated rapidly and she was now more in hospital than not. 10 days before my wedding we moved mum from the hospital to a hospice. And after a week of agonising hell my wonderful mum passed away. Losing someone you love is truly devastating. To this day, I am still grappling to find words to explain the absolute grief that followed for us. You cannot help but lose yourself to it. And during those months I couldn’t bear the thought of marrying without her there. But Simon was my support and my guide through the darkness and when things started to come back into focus I realised that the thing I wanted to do more than anything in the world is marry this incredible man who had held me and loved me and walked this horrendous path with me – exactly as my mum would have wanted. 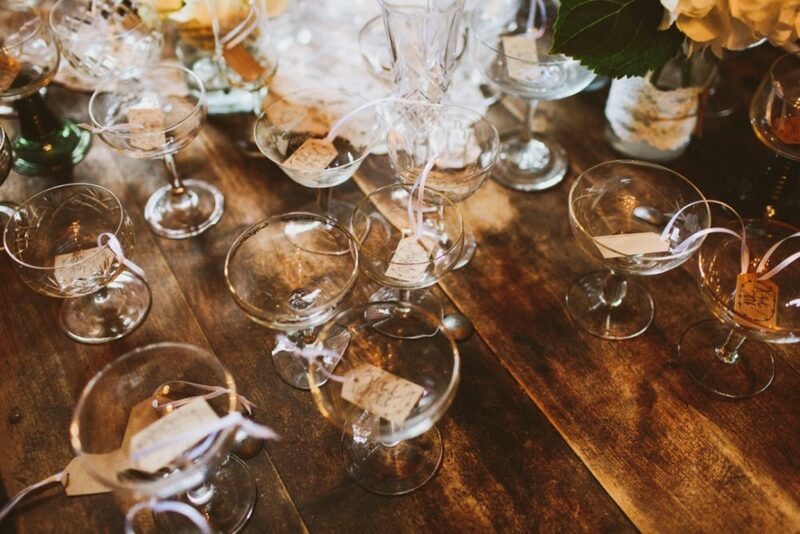 So below outlines the details of my wedding – a celebration after devastation. But, for others who may have experienced loss before their wedding, I can tell you that I felt her with me every second of my wedding day. She was there waking me with the morning birdsong, laughing with me in the wind as we waited outside the church to walk down the aisle, kissing me with raindrops in the afternoon, dancing with me in the falling leaves and shining with happiness with the stars. Her legacy of love, support and friendship lives on in my amazing family and her wonderful friends who were present at our wedding. And while it will never be good enough that she wasn’t there with me on my day I know how absolutely blessed I was to have her as my mum and best friend and how delighted she was for me – marrying my soulmate. We decided that our wedding would be a celebration, full of fun and enjoyment. We were keen to keep it all as relaxed as possible and very personal. We asked our favourite curry house in my home town to cater for the main meal and Simon’s mum and her best friend Carol kindly provided evening food. There was no seating plan during the day and we were very easy on timings. We focused the whole reception on having a huge house party, with lots of great food, booze and dancing. I was brought up in the Peak District and it is now a very special place for both Simon and I so we wanted to share the beauty of the Peaks with all our lovely friends and family. As we had a lot of ideas and were working within a fairly tight budget, we were looking for a venue that we could do everything ourselves. 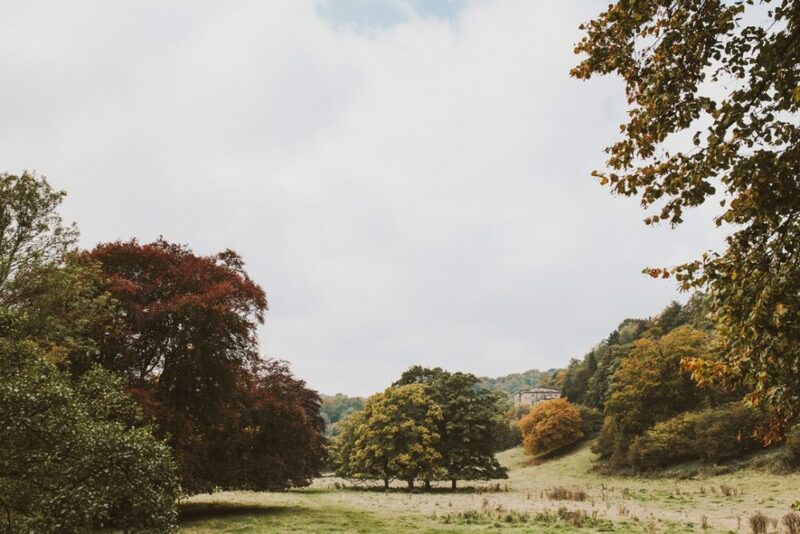 When we visited Hargate Hall we could not believe how perfect it was for what we wanted – we got the whole hall, a marquee, a fire pit and accommodation and could do everything we wanted with it. The Hall has such character to it and is set in stunning countryside. 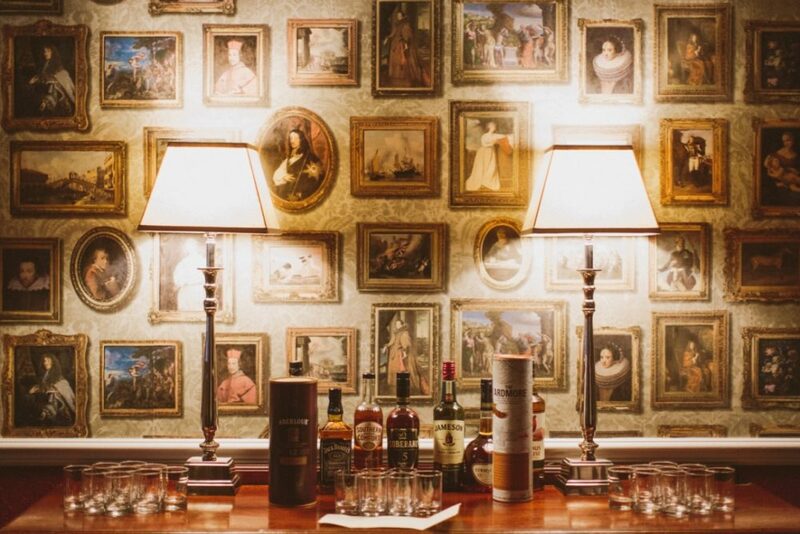 Simon would say that he fell in love with it when he saw the potential of having a cheese and whiskey room! I am extremely lucky as my sister is an extremely talented professional designer and seamstress so offered to make my dress for me. Susie understood my vision for the wedding and perfectly and designed a dress that captured the classic and original style with something that I would feel myself in. I don’t believe there is a dress in the world I would have been happier with – it was perfect! 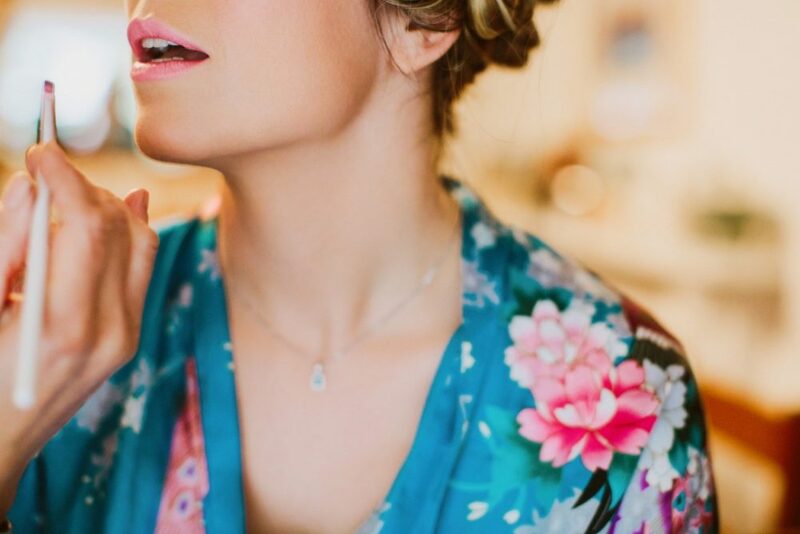 Simon chose the most incredible engagement ring for me – vintage and art deco with an emerald stone – so I was keen to keep my accessories within that theme. My wonderful friend Katherine had a bespoke hairpiece with emerald vintage broaches made for me and my father in law brought me a beautiful necklace which matched my ring. For my something borrowed I wore my mums engagement ring, which my sister inherited after she passed away. 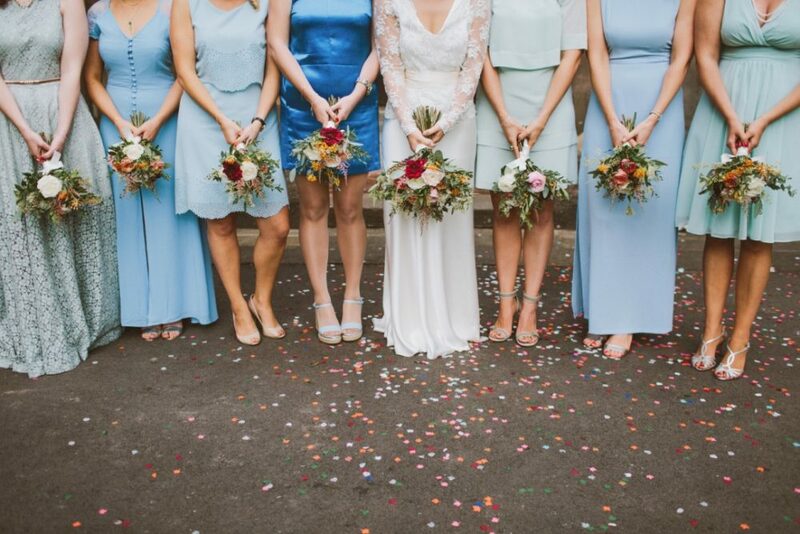 Cristina and Niamh did miracles with mine and the bridesmaids hair and make up – reflecting our theme in their creativity with such enjoyment and fun. Simon wore a gorgeous steel blue, three piece, Paul Smith suit. 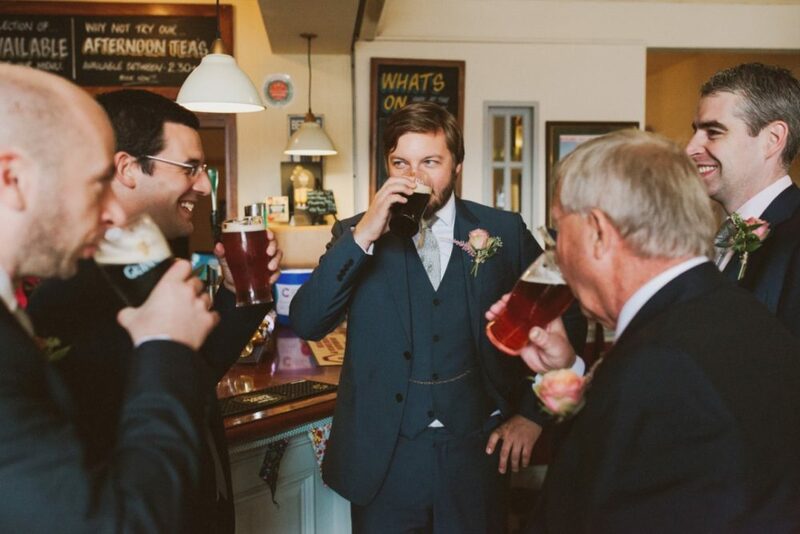 He wore his granddad’s pocket watch, which his dad also wore on his wedding day. We really wanted our ceremony to be the most special part of the day. We see marriage not only as a commitment between Simon and I, but also as a commitment from our friends and family to love and support us through our married life together – the wonderful parts and the more difficult parts. For this reason, we wanted as many of our friends and family to be involved as possible. For the readings we asked one of my best friends, Andy, to read Psalm 103 – a verse that my mum had chosen for our wedding before she passed away and Katherine, read a favourite poem of Simon’s, ‘To Love is Not to Possess’, by James Kavanaugh. Our extremely talented friend, Flick, played ‘Home’ by Edward Sharpe and the Magnetic Zero’s on the cello as I walked down the isle. We asked two couples that we love and admire, and who had supported us through the previous years, to sign our register and a very close family friend gave an incredibly beautiful address, which will forever be so special and important to us both. We were incredibly lucky again, as my cousin Libby is a brilliant professional florist and offered to do our bouquets and buttonholes. She talked through with us the colour theme of the wedding, which was colourful autumn shades, and sent us through design ideas. 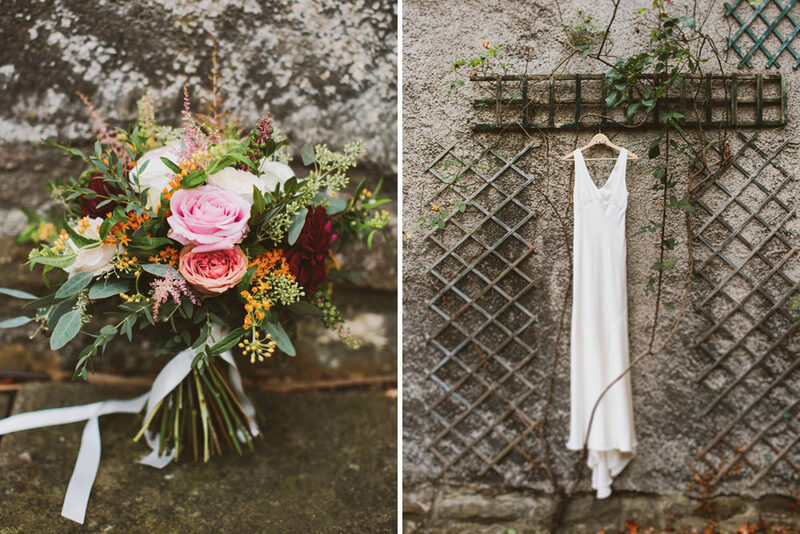 They were absolutely stunning when they arrived and even though I was terrible at giving direction as I know so little about flowers, Libby created exactly what I was after – a miracle worker! We wanted the main hall to have a classic, vintage feel with lots of sparkle so we hung white fabric from the ceiling and threaded fairy lights around the whole hall. We kept all decorations in the hall white, so had vintage lace bunting and white hydrangeas and baby’s breath scattered around in jam jars. 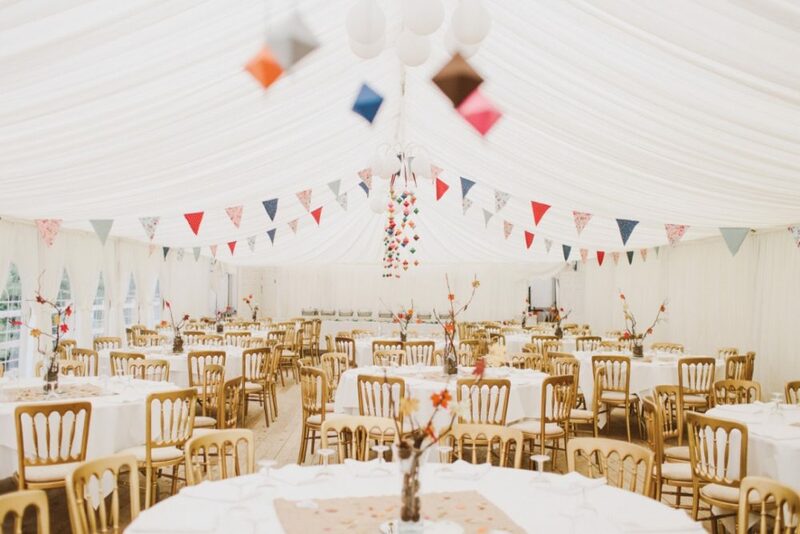 We wanted the marquee to have more of an autumnal feel, so used autumn colours for the homemade bunting and coloured paper diamond chandeliers and for the centrepieces we used borrowed vases filled with autumn cones and branches, with glitter leaves hanging from the branches. On each table we left a Polaroid film and little pegs so people could also hang pictures of themselves on the branches. We decorated the bar with photos of the wedding party, as well as pictures of family members who we wished could have been with us. We had cocktail dispensers, personalised glasses and my dad went all the way to France to get some amazing vintage looking champagne bottles. As Simon loves whiskey and I love gin, we decided to create a cheese and whiskey room and a gin and cake room. And around the fire pit we had placed blankets and marshmallows on sticks for later in the evening. We really wanted to thank our friends and family with a small gift, for all of the support they had given us over the previous years. We thought long and hard about what would be special, used again and in the style of the day. We came up with the idea of second hand champagne saucers. Over the months before the wedding we and our families, especially Simon’s Aunty Linda, scoured the charity shops for these glasses and we ended up with quite a collection. This meant that everyone at the wedding had a beautiful glass for the day and could take it home and enjoy it forever. All the decorations at the hall and the church were home made – which made for many an enjoyable crafty project! 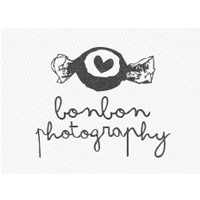 Our photographers, Bonbon Photography, were recommended by a number of different friends, and after taking a look at their website we knew they were exactly what we were after. On the day they were so creative and fun, professional and easy going – everything you want from your photographers on your special day. And even though it was the first time we met, we felt so relaxed with them and genuinely enjoyed spending time with them. As for the end result – the photos are absolutely stunning. I cannot believe how they captured the essence of the day perfectly as well as making each photo is an individual piece of art. What a talent! These are pictures will be treasured for our whole lives, and a reminder of the best day. We didn’t really know where to start in looking for a band – there are so many online and they can be so expensive. However on the Hargate Hall forum, one of the future grooms was in a band – Kings Of The Dance Floor. So after viewing a couple of videos of them and reading the reviews we went ahead and booked them. This was such a good decision – they absolutely rocked our wedding. Everyone was on the dance floor having the most incredible time and I cannot count the number of people who have said to me that they were the best wedding band they have ever heard. They even learned our first dance ‘Baby I’m yours’ by the Arctic Monkeys, and played it perfectly! The most special part of the day for both of us was definitely saying the marriage vows to each other. There was also another very special moment in the day for me though. On the morning of the wedding, my sister brought me and dad together to show us that she had sewed a beautiful heart in our dresses and dads tie in the fabric mum was going to wear to our wedding. She had sewed it close to our hearts so we could feel close to her all day. Our biggest bit of advice to any couples getting married is to plan a day that is absolutely true to yourselves. Lots of people will have lots of advice for how you should and shouldn’t do your wedding – listen to the helpful bits, but ultimately go with your heart. Then work out exactly what your priorities are and what you want to do and just go for it. What a beautiful beautiful story! Couples so often forget the important things and stress about the smallest details, when planning a wedding. I’m so sorry for your loss but what a stunning wedding & bride. absolutely stunning photos Kim, well done! 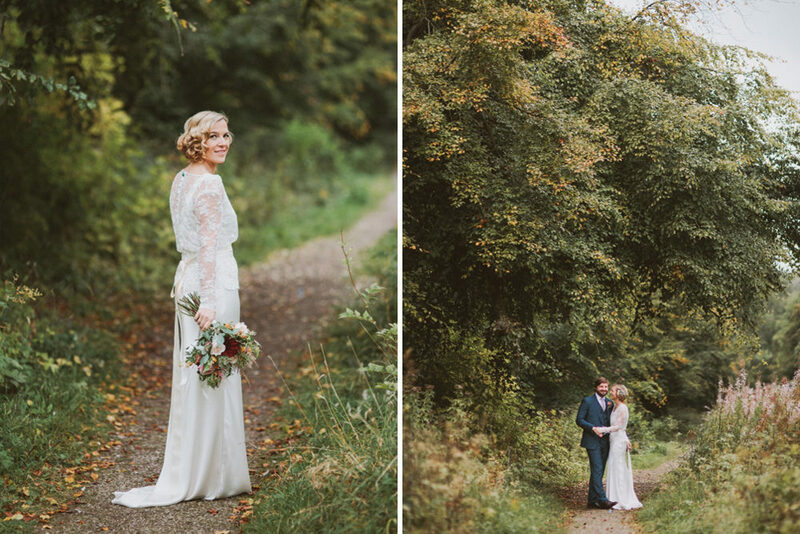 I love Jo’s dress and the photos capture the day perfectly. This wedding is SO pretty!!! Absolutely stunning! Love everything about this beautiful wedding. Jo is sublime – that dress! All captured so brilliantly by the awesome Bon Bon.